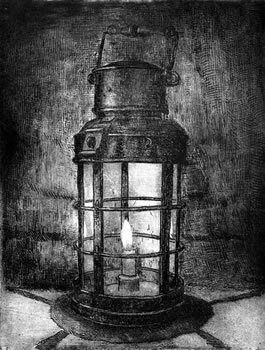 Etching is a rather special art form worth explaining since it is not that common. In etching, a metal plate, usually copper, is covered with a waxy "ground". This resists acid. The artist then draws his design on this plate, scratching off some of the waxy ground with a pointed etching needle so exposing the bare metal. When he has finished he dips the plate into a bath of acid. Where the ground has been scratched away the acid bites into the plate leaving lines sunk into it. The plate is then warmed and the remaining ground is then cleaned off it. The plate is inked all over, and then the ink wiped off the smooth surface, leaving behind only the ink in the etched lines. The etcher then takes a piece of thick, high quality paper which is moistened with water to soften it and places this over the wiped metal plate with its inked up lines. This is then put through a high pressure manual printing press. The paper picks up the ink from the etched lines, making a print. Obviously this process can be done many times making etching a form of printing, but since the plate needs to be hand inked for each print, no two prints come out looking exactly the same. If that sounds simple, the reality certainly is not. Starting with a design prepared in some other medium, say pen and ink, the etcher has to decide how hard or how soft his lines will be, then how moist the paper should be and how thick the ink should be. There are also other techniques which can be used to make parts of the etching look like the work of a paint brush and how light or dark the image comes out is affected by all these factors. Toned inks and several plates can also be used to produce prints with colours. So why bother? 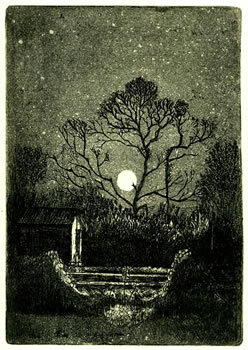 Introduced originally in the sixteenth century as a form of printing etching was overtaken by other more mechanised methods, but it remained and remains a medium which is loved for the delicate moody quality it gives, a quality which works particularly well with many subjects and this is very clear in the work of local artist etcher Will Vaughan. Will Vaughan is Emeritus Professor of the History of Art at Birkbeck College, University of London, a post he held from 1986 until he retired in 2003. 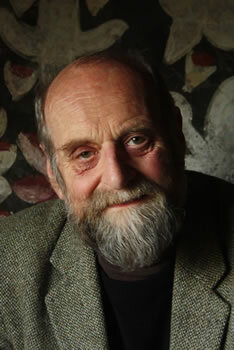 Previously he had been an Assistant Keeper at the Tate (1968-72) and a Reader at University College London (1972-86). On retiring he came to live with his wife Pek Peppin outside Castle Cary in an amazing old farm house originally built around 1435. They bought the house years earlier knowing it needed a great deal of very careful restoration work which needed to be done with help from English Heritage. As a result today the original beams are all strengthened and exposed together with the unusual and rare murals in what is thought to be an ancient confraternity meeting room or chapel. It was here then in a study studio built at the back of the house that the art historian took up his new passion, etching. 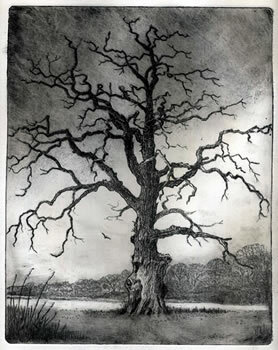 Introduced to the technique by local artist Brigid Moreton, Will has dedicated himself to become highly proficient in the practice of etching, particularly being attracted to local scenes and trees which he imbues with a richly romantic and melancholy atmosphere. To see more visit his site www.willvaughan.com. 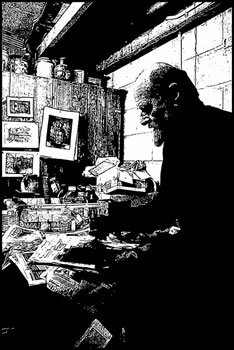 Will at work in his studio.